Why buy takeout when you can make honey-garlic chicken at home? Kids and adults love this quick and easy recipe that’s ready in minutes. I love eating out. The best part is not having to do the dishes when we’re done. 😉 The worst part is the price and all of the unknown ingredients in restaurant food. Making copycat recipes at home is fun, and you can play around with the recipe and substitute healthy ingredients until you get just what you’re looking for. 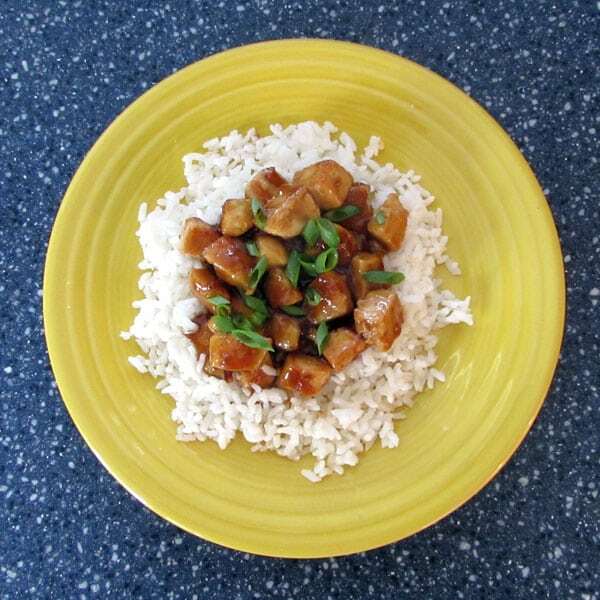 My Better-Than-Panda Orange Chicken is a favorite copycat recipe with our family. 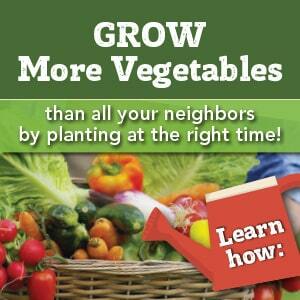 And judging by the thousands of saves it has on Pinterest, it’s a favorite with you too! The last time we went to Panda Express, I got Orange Chicken and Honey-Garlic Chicken. Of course, I did my level best to figure out what was in that honey-garlic sauce so I could make it at home. After a few experiments, this delicious recipe was ready to share. 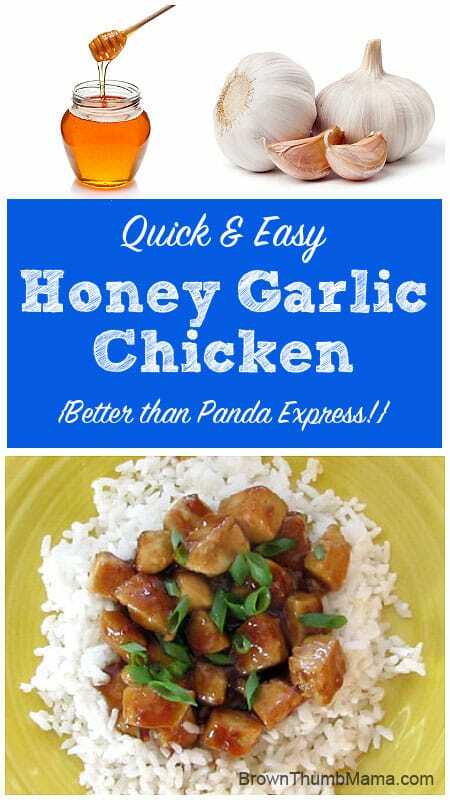 Honey-Garlic Chicken is a quick and easy recipe that your whole family will love. Cut the chicken into bite-sized pieces, and pat gently with a paper towel to dry. This will help the chicken get a yummy brown crust, without coating it with flour. Melt the coconut oil in a large frying pan over medium-high heat. 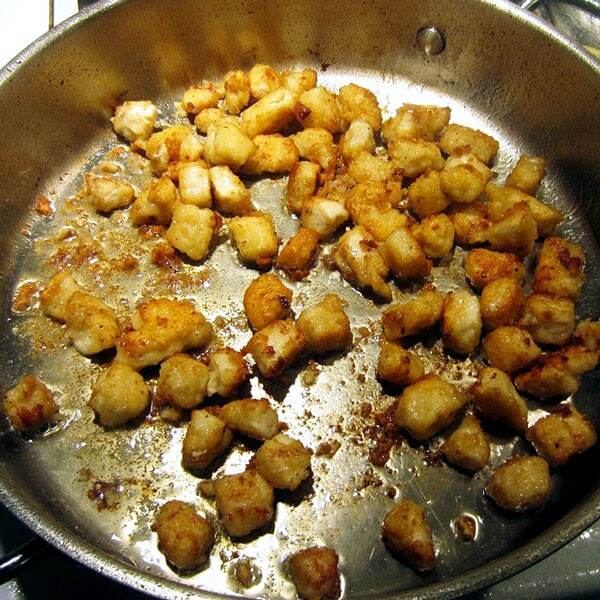 Put half of the chicken in the pan and let it sit. Resist the temptation to stir it right away, or it won’t get brown. After a few minutes, check one piece. If it’s browned to your liking, stir and finish cooking that batch. Take the first batch out and set it on a towel while you cook the rest of the chicken. Put the cooked chicken on a paper towel so it doesn’t get soggy from being piled on a plate. 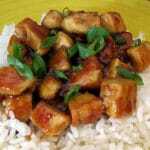 To make the sauce, mix honey, garlic, soy sauce, and a few other ingredients. Heat to thicken and serve with the chicken over hot, steamed rice. If you don’t have fresh garlic, use 2 Tablespoons of your homemade frozen chopped garlic. Instead of fresh ginger, you can use 1 drop of Ginger essential oil. Make sure the oil you’re using is a premium brand that’s safe for internal use–learn about my favorite brand here. Don’t skip the Sriracha! This small amount won’t make the sauce spicy, but it adds depth of flavor. Hubby and I like a lot of garlic, but the kids? Not so much. We often serve the sauce on the side, so the kids can eat their chicken plain or just take a tiny bit of sauce. Time-saving tip: Make a double batch of sauce and freeze half. When you need a quick meal, make rice, grab your prepared chicken, warm your sauce, and serve. Melt the coconut oil in a large frying pan over medium-high heat. Put half of the chicken in the pan and let it sit. Resist the temptation to stir it right away! After a few minutes, check one piece. If it's browned to your liking, stir and finish cooking that batch. Take the first batch out and set it on a towel while you cook the rest of the chicken. Put the cooked chicken on a paper towel so it doesn't get soggy from being piled on a plate. Combine all of the sauce ingredients, except the cornstarch and water, in a saucepan. I like to buzz it with my stick blender for a few seconds to ensure the garlic and onion powder is incorporated thoroughly and there are no lumps. Bring the sauce to a gentle boil and simmer for 3-4 minutes. In a small bowl, combine the cornstarch and water. Add about half of this mixture to your sauce, stirring while you add it. The sauce will gradually thicken—add the rest of the cornstarch mixture if you'd like it thicker. 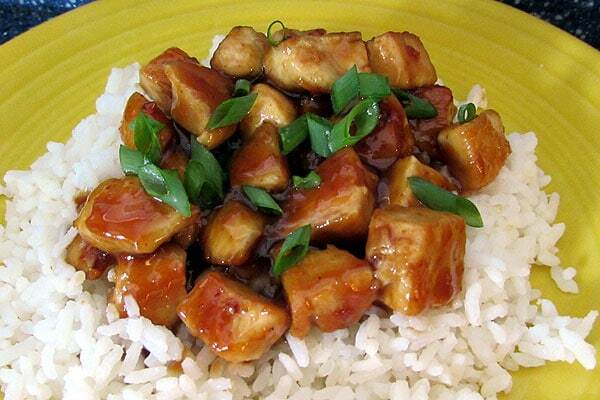 Combine the chicken and the sauce, and serve over hot steamed rice.